This Irish-themed online slot is the work of the Barcrest studio. It's played on two separate reel-and-row sets. One of them is a five-by-four layout, and the other is a massive five-by-twelve. Within the structures are 100 pay lines. RTP starts at 96% but can be amended by the bonus features. If you want to try your hand at this slot, do it right here at UK Slot Games, where we also have more than 500 amazing online slots to play including Great Rhino, Starburst, the original Rainbow Riches and Bonanza. Rainbow Riches is one of the best-known and most-played online slots in the world. The original version of it came out in 2009, and set the bar for what a great Irish-themed slot should look, sound and feel like. Such was the success of the first slot that the developer have been rushing to create sequels ever since. They produce at least one every two years. This entry into the legend first saw the light of day in 2016 and may be the most complex and unconventional slot in the whole series. 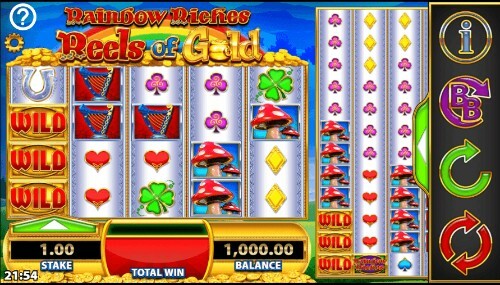 Rainbow Riches: Reels of Gold works to the same theme idea that all of the Rainbow Riches slots work to; this is a colorful and cartoonish Irish fantasy land, full of leprechauns and their pots of gold, brightly colored rainbows, and harps and clovers. It's a stereotypical view of the Emerald Isle, but it's represented lovingly and with affection. The color palette of the slot is so bright you almost want to play wearing sunglasses, and the Irish music playing in the background will get your toe tapping even if you don't want it to. The reels in this slot take some explaining. There are two sets of them, all of which spin at once. On the left, we have a 5x4 layout, which would be considered large at any other time. Here, though, it's dwarfed by the enormous 5x12 set on the left. Because of the huge reels and rows, there's almost nothing to be seen in the background at all - just a touch of green and blue, and a glimpse of Ireland's verdant fields. With so many reels to keep an eye on, Rainbow Riches Reels of Gold makes things a little easier for you by using a limited set of symbols. The four suits of a pack of playing cards represent the lower values, and above them are a harp, a horseshoe, a four-leafed clover, a toadstool, rainbows, and a very happy little leprechaun. There’s also a wild symbol to keep watch for, and it comes in the shape of the slot’s logo. It will substitute for anything apart from the scatter to create wins for you, excepting the scatter, which is represented by a balloon. It’s more likely in this slot that you’ll see wins on the right-hand set of reels than you will on the left-hand. The left still has its uses though, because when symbols stack and fill a reel on the left, they transfer and fill the same positions on the right. You now have clone reels to boost your winning chances. This is especially useful when your stacked symbols are wilds. It’s not just the base game that’s complicated in this slot; the bonuses take some getting used to as well! We’ll start with the most simple feature, which Is the Free Spins round. That's triggered by balloons appearing on reels one, three and five of either set of reels. They can be split across the reels, which makes your odds of triggering the round better than they would be otherwise. It also means you could have up to six scatters in sight. Trigger the feature, and you'll be presented with a selection of balloons, which you pop to reveal a number of free spins. You can pop as many balloons as you have scatter symbols, so the more the better. When you're done popping, you can either accept your tally and start the feature or take a gamble to increase your number of free spins. If you choose to gamble, be aware that you may lose all your free spins. You must be playing with a stake of at least 50p to take the gamble. The Big Bet feature which is common of Barcrest slots is also on hand here. It's an option for players who like to take a ‘high-risk, high reward' approach to play. For an increased stake, the RTP jumps to 98%, and you'll receive five free spins. You can choose to take these spins with expanding wilds (which affect both sets of reels), or you can increase the stake even further and have expanding wilds plus any bonus symbols found during your next five spins count towards the tally you need to access the free spins feature. The remaining bonus features are Reel Modifiers, which can happen at any time. This slot has a guest star in the shape of a Magic Fairy, who may choose to bless your reels with one of her magical talents. Her impact on your game can take one of six forms. She might provide a Wild Burst of butterflies, which flutter across your reels, turning each symbol they touch wild in the process. She can also produce a set of Magic Wilds which stack on any of the reels and cause the entire playing area to be re-evaluated to find new wins. If you’ve had a win, she may appear and apply her Reel Win Multiplier, which increases the value of your win by double, treble or even five times! If she chooses to use her Magic Symbols ability, each low-value symbol on your reels turns into one matching symbol. You probably don’t need us to tell you what her Guaranteed Win skill does, but in case you do, it guarantees you a win on your next spin. When you spin and come up one balloon short of entry to the free spins bonus, the fairy might take pity on you and give you an Extra Balloon to get things started. Not everyone is going to love this slot purely because it has so much going on, and it runs the risk of being overwhelming. Despite the complexity, it is easy to play and follow when you’ve become accustomed to it. It’s also a lot of fun because of all the extra features. In short, it’s a worthy addition to the Rainbow Riches franchise. For a whole generation of British slot game players, the name ‘Barcrest' will evoke a wave of nostalgia. They were the company who manufactured the majority of fruit machines that could be found in pubs, bars and bingo halls throughout the 1970s and 1980s. Barcrest served most of mainland Europe as well as the UK and were one of the leading brands in their field. Because of their success, they came on the radar for a potential takeover during the 1990s. American gaming company IGT were looking to expand into Europe, and so they bought Barcrest outright for that purpose. Barcrest's name was kept alive, and during the time of IGT's ownership, they produced the first ever Rainbow Riches. The success of that slot made them even more valuable, and so Scientific Gaming came along and bought them from IGT in 2011. Because the Barcrest name has such value and familiarity, Scientific Gaming also decided to keep it in use, and so Barcrest lives on as a trading style, and a sub-division of their parent company. These days, you'll find them working from their office in Manchester, UK. They're probably developing the next Rainbow Riches slot as we speak!